Patrice and John have devoted much of their lives to exploring how to bring more love, awareness, meaning and purpose to life. For many years, John has studied esoteric spirituality, which is the understanding, experience and application of universal laws and principles to practical living. We both believe that our challenge as human beings is to become conscious of what is now unconscious in us. Our life journey is to explore those parts of our nature that are presently hidden from us so we may express ourselves more genuinely. 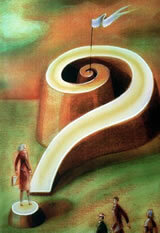 We know questions to be powerful tools to help us probe the mysteries of who we are. For over 40 years John has been asking himself and others smart questions to draw out deeper wisdoms, truth and guidance. He has applied questions to all aspects of his life. We feel strongly that awareness is the most powerful resource we have to effect change in our lives. Without awareness, we unconsciously react, analyze, judge and interpret, without really knowing what's going on. As awareness increases, we see more clearly the dynamics at play. This gives us the accurate information we need to consciously choose what's best for us and others. And the best way to be conscious and to be aware is to STOP and PAY ATTENTION. We have created Smart Question Coaching to support you in developing a continuity of paying attention to answers that come to you. As you spend a minute each day you will develop self trust and know yourself and the quality of your answers.